I have an 8 yr old son who is good in school and very smart but at home he is starting to become very rude and disrespectful. He does not want to do anything he is told to do and gets very angry when we make him. He slams doors, yells, pushes his siblings, covers his ears when we are talking, storms out of the room, ignores etc. His teacher says she notices him getting very mad at little things that don't really matter. He blames everyone and always says things are not fair. He wants me to treat him like I treat my husband but he is only 8. His dad and him do not get along very well and he has made the comment that he just wants his dad to leave and never come back home. Which tears me up inside. My husband "Tom" does not seem to think he is doing anything wrong. Tom has a difficult time showing interest in him and the only time he does it is on his terms. My son may show him a Leggo creation he built and is very proud of and Tom just may say you need to get ready for bed now. He does not try to play games or get involved with their lives. I bet he could not even name one of his friends or even know his favorite color. 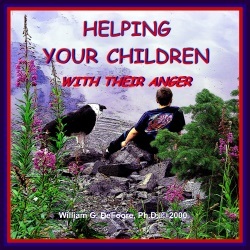 It is the tough love that he grew up on, but it is making our son very angry and it is showing in other situations now. He just seems to be shutting down into his own world of frustration. I mention this to Tom and he just says that he needs to toughen up and deal with it or he will get mad himself and storm off. He acts more like a teenage big brother than a dad. I looked into counseling but we do not have great insurance so it would be very expensive. If you have any suggestions I will be so grateful. Hello, and thanks for telling your story here. Your situation is challenging, and you're obviously a very caring mother. I will try to help. I wonder if you're too easy on him, to counterbalance your husband's "tough love" approach. This would be very understandable. Your comment about your son wanting you to treat him like you do your husband brings this to my mind. If you think that is a possibility, I suggest you take a very serious look at the program below, and be sure and listen to the free previews! Regarding your husband, I strongly encourage you to try to shift your focus, so that you're not blaming him. Certainly he has his shortcomings as a father, but it will help you, him and your son for you to focus more on his strengths than his weaknesses. Use this positive journaling process to help you with that. I suggest you journal daily about your husband's positive aspects, using the gratitude-appreciation-optimism process. Follow these recommendations, and I think you'll start to see some progress in your son and your family.